Hope you had a great winter. We're looking forward to our sixth year of sea kayaking on Deer Isle. Last year, as well as many one-day trips, we also guided five very successful multi-day trips and we hope to be doing even more overnight kayak-camping trips this year. Already we're booked for two overnight trips in June, a special time of the summer since days are long and nights are short and everything is fresh and new on the islands. We're adding four-day trips to the mix this year and on these longer paddles will be exploring Isle au Haut as well as islands of the Merchant Row chain. Last year we expanded our camp menus to include delights such as Spanish tortillas, samosas and blueberry muffins and homemade fig-and-almond granola bars... there were no complaints that I heard! To kick off the new season we have a special offer for returning kayakers. If you've paddled with us before and book a multi-day trip for any time in July, you're eligible for a free night's stay w/ breakfast (a $95 value) before the trip. Wake up on the morning of your trip refreshed and ready to go with no traveling involved. Call us at 617-957-8802 to reserve this special deal. This year we're again planning to participate in the Maine Island Trail Association (MITA) bi-annual island cleanup. Twice a year MITA organizes trash pickup on all the islands of the trail and in June and September we remove trash from islands around Deer Isle and Stonington. Each island is also monitored throughout the summer season by volunteer stewards and I'm happy to announce that this year I'll be a steward for Buckle Island, keeping an eye on the island through the summer. This summer, we'll also be contributing to the Maine Center for Coastal Fisheries, an organization whose mission is to secure a sustainable future for fishing and fishing communities in Eastern Maine. Driftwood Kayak will be offering by auction a 2-day kayak-camping trip for two people to take place in August. In April this year, we contributed an article to Atlantic Coast Kayaker magazine entitled, 'Voices of Experience - a Near-Miss at Sea', where we discuss an incident from last summer and propose a format for reporting 'near-miss' incidents while kayaking, a format which is similar to that used in the airline industry. I discovered this new book while researching seminars by its author who is, by day, a professor of particle physics at Harvard and in his 'free time', lectures and writes about navigation and weather systems. 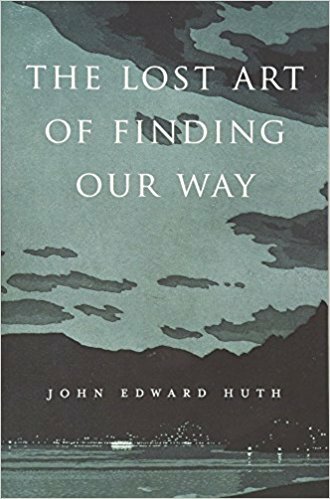 I recently attended one of his seminars and later found his book, which is all about the art of navigation - especially navigation in wild places - to be a fascinating read. John makes seemingly simple observations and drqws complex conclusions about navigation which you can discover and try out yourself. Anyone who is at all interested in discovering how early man successfully navigated the globe and how, in the age of GPS, these techniques are still useful today, will find this book a must-read.